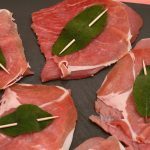 Roman Saltimbocca alla Romana: veal roman style. Take some thinly sliced pieces of veal. 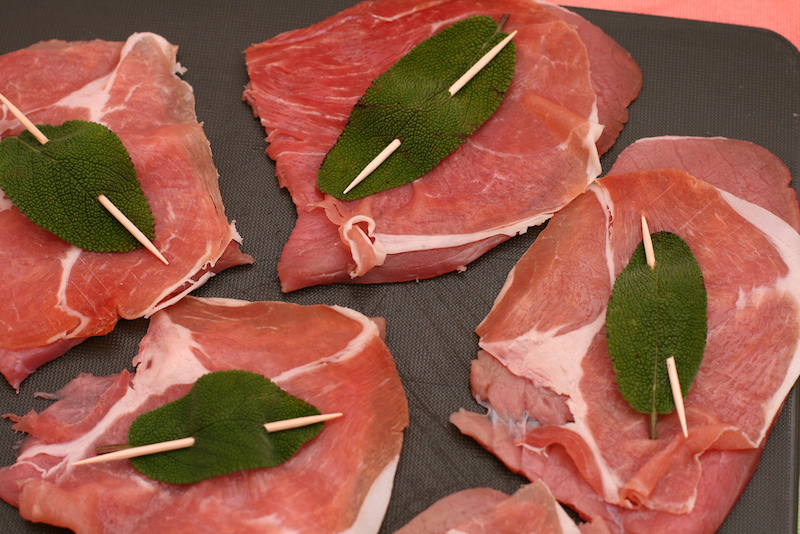 Lay each slice flat, and on each place a thin slice of prosciutto (the ideal is cured prosciutto, but you can also try cooked ham if worse comes to worse) and some leaves of fresh sage. Fold the slice of veal over and close with a toothpick to keep it all together. Roll the veal so prepared in some white flour. In a non-stick frying pan, place a good bit of margarine and some fresh sage leaves. Heat the margarine and then place the veal rolls gently in the pan. Cook over a medium flame until brown and then turn over to brown the other side. Add salt at the end. This is best with a nice fresh salad, and followed by a long walk.